Savvy businesses doing their travel homework often find surprising gems in Hawaii’s short-term housing market that can be much more convenient and less expensive than using traditional hotel rooms. “Waikiki has gotten so expensive that it’s pricing out the short-term business travelers, especially those who come over to Hawaii for several months at a time,” said Keana O’Conner, who has worked in the real estate industry for 15 years. The average room rate in Waikiki is $268-$346, not including a $25-200/night parking fee, and renting a furnished house can be significantly more expensive if you want to stay on a sandy beach. There are also very nice, reasonably priced, furnished homes that are available on a month-to-month basis. Private homes almost always offer free high-speed wifi, free parking, a washer/dryer and a kitchen that makes preparing meals at “home” a viable option. Guests do not have to share their grill or pool with a crowd staying at the hotel either. 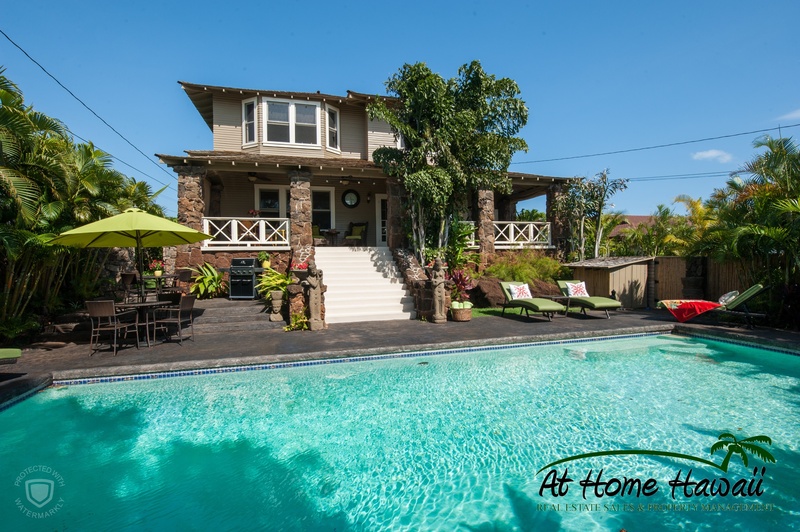 Let’s take a closer look at Na Pua Lani, a charming property that consists of three separate homes in Kaimuki. Na Pua Lani, “The Heavenly Flowers”, is just 15-20 minutes away from downtown Honolulu or Waikiki. The three houses are named: Hibiscus, Plumeria, and Pikake. Hibiscus is a beautifully redone, historic home, with 5 bedrooms and a large pool. Currently, this home rents for $10,500 a month, which comes out to only $350 a night. Nick Portrey works for California-based M Bar C Construction, and spends nine months out of the year living out of hotels, traveling for work. “We had three vehicles,” Portrey said of his most recent stay at Na Pua Lani. “I feel that parking should be included in the room fee. So it was great to stay in a home that had plenty of parking.” Portrey and his team of nine people worked six days a week, so staying in a home with a reliable washer and dryer, a kitchen, and even a grill by the pool alleviated their busy schedule. Portrey also found the property management representatives from At Home Hawaii to be friendly, responsive, and helpful throughout their stay. The M Bar C Construction group was so satisfied with their experience that they decided to look for a similar home setup in Boston, their subsequent work site. “It worked out so well that it set a precedence for the next out-of-town job,” he said. If a group is larger or smaller, reservations can be made for more than one house or reservations could be made for one of the two smaller homes for rent. The Plumeria is a four bedroom, two bath home and the Pikake is a two bedroom, one bath cottage. These rent for $7,500 and $4,500 per month or just $150-$250 per night.